CG Vyapam Recruitment 2019: CG Vyapam: Chhattisgarh Professional Examination Board (CGPEB) / cgvyapam.choice.gov.in is conducting recruitment processes to fill 14,580 vacancies. As of now, there are two recruitment drives going on for B.Ed/ D.El.Ed. Entrance Exam 2019 - Online Form and Apply Online for 14580 Lecturer & Teacher Posts. CG Vyapam Recruitment 2019 - Apply Online for Maanchitrakar & Anurekhak Posts (CTC19) in Chhattisgarh on Direct Recruitment. Online Applications are invited by CG Vyapam: Chhattisgarh Professional Examination Board (CGPEB) from 19 Feb 2019 to 10 Mar 2019 till 11:59 PM and Examination to be held on 23 Apr 2019 from 09:00 AM to 12:15 PM for 10 vacancies. CG Vyapam Recruitment 2019 - Apply Online for Chhattisgarh TET 2019 in Chhattisgarh. Online Applications are invited by CG Vyapam: Chhattisgarh Professional Examination Board (CGPEB) from 17 Jan 2019 to 03 Feb 2019 11:59 PM. CG Vyapam Recruitment 2019 - Apply Online for 250 Patwari Posts in Chhattisgarh. Online Applications are invited by CG Vyapam: Chhattisgarh Professional Examination Board (CGPEB) from 11 Jan 2019 to 31 Jan 2019 till 11:59 PM and Written Examination to be held on 17 Mar 2019 from 10:00 AM to 01:15 PM for 250 vacancies. CG Vyapam CG Pre MCA 2019 - Apply Online for CG Pre MCA 2019 in Chhattisgarh, Punjab. Online Applications are invited by CG Vyapam: Chhattisgarh Professional Examination Board (CGPEB) from 26 Mar 2019 to 14 Apr 2019. CG Vyapam CG PPT 2019: Chhattisgarh Pre-Polytechnic 2019 - Apply Online for CG PPT 2019: Chhattisgarh Pre-Polytechnic Exam 2019 - Chhattisgarh. Online Applications are invited by CG Vyapam: Chhattisgarh Professional Examination Board (CGPEB) from 26 Mar 2019 to 14 Apr 2019. CG Vyapam PET/ PPHT Entrance Exam 2019 - Apply Online for PET/ PPHT Entrance Exam 2019 in Chhattisgarh. 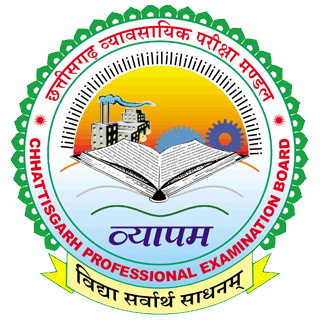 Online Applications are invited by CG Vyapam: Chhattisgarh Professional Examination Board (CGPEB) from 19 Mar 2019 to 07 Apr 2019.